Updated July 23, 2015 at 6:40 pm: The TTC has corrected an arithmetic error in its bus fleet plan. The section on the Purchase of New Buses has been modified accordingly. Updated July 23, 2015 at 10:30 pm: The TTC has clarified how it counts child riders now that they do not pay a fare. The section on the CEO’s report has been modified. 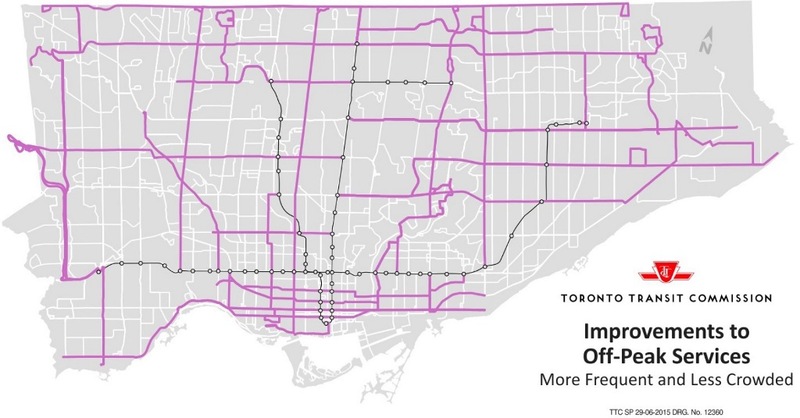 Updated July 25, 2015 at 2:45 pm: Charts added showing the effect of running times on Queen between Bathurst and Yonge caused by the diversion around TIFF in 2014. Ridership for 2015 is running below budget levels with a year-to-date shortfall of 1.2%. For May, the decline is only 0.2% and the TTC hopes that they will continue close to budget for the rest of the year. The decline is attributed to two factors – the severe winter which deterred travel generally, and the March fare increase. The latter is an intriguing claim because one might expect that the budget would allow for fare increase effects, and therefore the short term drop was larger than predicted. Total ridership for the year is expected to be 540 million, down from the predicted 545m. This affects farebox revenue, but there are offsetting cost savings in some areas notably leasing costs (the budget provided for an earlier start to the York Region bus garage lease), lower than expected utility and fuel costs and consumption, lower costs for some supplies and services, and lower than projected accident claims. These savings are partly offset by higher than projected Presto service fees, implying that Presto takeup as a fare medium is running ahead of projections. The net effect is that projected subsidy requirements for 2015 are unchanged. Capital spending is running ahead of budget, but this is primarily a timing issue, notably for work around Davisville Station to improve trackbed stability and signal reliability which was brought forward from 2016 to 2015. The full project to rebuilt the infrastructure between Muir and Berwick portals (the open cut area from north of St. Clair to Eglinton Station) is still at the design stage. On the basis of counts and the observed fact that children have represented 2-3% of our ridership for decades, we never expected a huge increase in children rides, so will use that historic data for now in our reporting. When Presto is fully-rolled out, children will get a Presto card resulting, of course, in a much more accurate count. The TTC continues to track service quality based on its ±3 minute metric which, as discussed here many times and acknowledged by the TTC itself, is fraught with problems. There is no word yet on when a new scheme will be introduced to better reflect riders’ experiences over all periods of operation and all portions of each route. That said, the measure for the 1 Yonge-University has improved and 2 Bloor-Danforth has held steady at the target rate. The TTC attributes this to improved scheduling, a focus on maintaining headways, and improved vehicle reliability on the Yonge line. On the SRT, recent months have seen a decline in reliability that will only improve with infrastructure and equipment overhauls now in progress. This work was supposed to return the SRT to its target reliability level in time for the Pan Am Games, but stats from that period are not included. The moving annual average is increasing because particularly bad months from Winter 2014 have dropped out of the average window. Bus system performance has fallen recently to a two-year low, and has been consistently worse in recent months compared to the same time a year earlier. This is attributed to additional delays due to road construction and the difficulty of maintaining regular headways. The TTC has not yet published route-by-route reliability data for the second quarter of 2015 which would identify the specific routes contributing to the decline of the overall average values. Streetcar system performance also continues to fall on a year-over-year basis because comparatively “good” months in 2014 are now replaced in the moving average by poorer months in 2015. A recent improvement is put down to the restoration of streetcars vs bus operations on 510 Spadina and 504 King, although the latter is an odd claim considering the amount of peak service now operated with buses on that route. Again, the absence of route-by-route numbers makes verification of the distribution of relative improvements difficult. The TTC makes no mention of vehicle reliability as a factor, nor of management attempts to regulate headways. A source of ongoing confusion with reliability-by-mode numbers is that data are combined from routes where nothing unusual is happening and those where there are major upheavals such as construction diversions and special events. The real questions should be what did “normal” service achieve, and how badly did disruptions affect specific routes? Combining the data allows problems with “normal” routes to be masked. A further problem, evident during debate on this report, is that even among TTC management, the actual metric of ±3 minutes relative to scheduled time, or scheduled headway, is cited interchangeably when these are, of course, quite different targets. Moreover, even if a service is not running “on time” but is maintaining a regular behaviour, that is what would-be riders value. The TTC has still not published its new rider-based performance numbers (“journey time metrics”), something we have been promised for at least two years. The increase in total fleet including new trains for the Spadina extension (TYSSE) and for eventual rollout of Automatic Train Control (ATC), plus the reassignment of all T1 trainsets to the BD line, places a strain on the TTC’s ability to house its subway fleet. Expansion work is underway at Wilson Yard for the TR trains (65 of 80 originally ordered have now been delivered), and at locations on BD to provide more storage. The contract to refurbish Vincent Yard (Keele Station) for T1 storage is out to tender. Work is also planned or underway at Davisville and Greenwood yards, and at Kipling Station. The new streetcar delivery schedule is still a matter of concern, and Bombardier only recently shipped car 4409, a month later than planned. The Board received a report at the June 22, 2015 meeting that advised Bombardier was behind the contractual schedule and was developing and implementing plans to recover the schedule with delivery of the 204th new streetcar in 2019. The most recent revised schedule was received from Bombardier on June 1, 2015. Bombardier has yet to prove that they are able to recover and meet the required production rate and quality requirements to achieve completion of the contract in 2019. The preliminary acceptance date for shipment of the eighth new streetcar from the Bombardier Plant, slipped from the revised scheduled date of June 19, 2015 to the week of July 20, 2015 or one month behind schedule. The Chair and Chief Executive Officer visited the Bombardier Thunder Bay Plant on June 23, 2015 and were advised by the President of Bombardier Transportation Americas the ramp-up plan for the Thunder Bay final assembly plant is challenging but achievable. Bombardier continues to conduct critical assessment of its plan and will publish an updated schedule upon completion of its review. In other words, we still do not have an agreed-to schedule for delivery of the new fleet. The planned delivery schedule from Bombardier is supposed to ramp up to 4 cars/month or 48/year by September 2015. This would put the target date for the 204th car in October 2019. This proposed schedule and revised commercial arrangements have not yet been agreed to by the TTC. Jennifer Keesmaat presented the TTC Board with an overview of the work of the City Planning Division and its relationship to the TTC. An important back-story to this material is that the TTC ceded responsibility for the planning side of the transit network to the City some years ago retaining only the technical aspects of design and operations. There was a time when the TTC led planning efforts, but this dwindled over the years with the rise of other competing agencies on a regional scale, and the rise of importance of many detailed factors on a local scale for which TTC culture and expertise simply were not equipped. Planning neighbourhoods and city development includes, but is about far more than transit infrastructure. These projects will define the future of Toronto; transparent, comprehensive, and collaborative planning is required. Within City Planning there is a Transit Implementation Unit responsible for integration of planning issues such as land use, urban form and community engagement with transit planning. (Operational issues such as how transit integrates with roads and signals are handled by the Surface Transit Operations Unit within City Transportation.) Financing, funding and intergovernmental liaison are also City responsibilities, according to the presentation, although this statement might be challenged by some at TTC. The City Manager and TTC CEO provide oversight for the work of the various groups. Other studies underway include SmartTrack/RER, the Scarborough Subway Extension alignment, the Eglinton, Finch West and Sheppard East LRT lines, and possible enhancements to the King streetcar. Most of these include Metrolinx and the TTC as appropriate. Keesmaat talked about GO/RER and SmartTrack, including the study of alternatives to the Eglinton West alignment to the airport, but did not tip her hand on where this work might be headed. Related issues include the service level that will actually be provided by a mixture of GO and ST trains in the same corridor which will have a major effect on the attractiveness of ST and of its ability to divert riders from other routes. Keesmaat was silent on these points. The Eglinton West alignment study will report in Fall 2015. The Relief Line study went through a process of seeking public input on station locations and then matching this to possible corridors (broadly speaking) for the route. If anything, this process gave the impression of going the long way around to arrive at what was the most likely “solution” from the outset, but if gave a chance for a wider review of options and understanding of why some would be preferable to others. We have reached the point where there are four potential corridors between downtown and the Danforth made up of the permutations of a Queen/Richmond or King/Wellington alignment in the core, and a Broadview or Pape alignment to the Danforth. Those who have been at public meetings will know that the Pape/King/Wellington combination appears to be winning out, but again Keesmaat did not suggest a specific outcome for a study that is still in progress. The next step will be a series of public meetings to review recommended corridors in the Fall 2015, and a final report in early 2016. Another wrinkle not covered by this presentation, but well-published from the June Metrolinx Board meeting, is the potential for very substantial off-loading of Yonge Subway demand onto a Don Mills Relief Line extending north at least to Eglinton and beyond to Sheppard. [See Yonge Relief Network Study especially the table at page 31.] This is an indication of the differing scopes between the City study, whose terms of reference are more restricted, and the Metrolinx study which reviews more territory. Should stations, notably one at Brimley/Eglinton, be added to the subway route to improve its coverage and ease of access within Scarborough? What level of service will operate east of Kennedy Station (current plans are for alternate peak trains to turn back at Kennedy)? What are the fleet and carhouse implications of the service level? How will demand on the SSE and ST lines interact depending on service, fares and feeder route networks? Again it is unclear how much detail will come back from a study that, to date, has been mainly about alignment and little else. The three Metrolinx LRT projects have a City Planning role because of their effect on the neighbourhoods through which the lines will pass, and on future land use and development that would occur. Eglinton is under construction with a 2020 target opening. Finch West will be tendered in 2016 for construction start in 2018 and a 2021 opening. Sheppard planning is scheduled to resume in 2018 with the intent of construction beginning in 2021 for a 2025 opening. Whether Sheppard is a “real” project is a matter of some debate considering the number of elections that must occur before a shovel will even get into the ground. The King Street study, jointly with City Transportation, is reviewing options for improving transit service in that corridor. What was common through all of these overviews was that Keesmaat presented the “here is what we are doing” view, but very little detail on the “here is where we are going” issues. This kept discussion at the TTC Board mainly to high-level issues rather than getting into the nitty gritty of individual projects many of which are controversial. Keesmaat then went into a quick review of the “Feeling Congested” study which seeks to determine future priorities for a wide array of projects based on many different criteria. The full extent of this project can be mind-numbing. This is not just a “transit” plan, but a review of the City’s Official Plan based on many factors including land use, street design, shared use of street space, demand management and goods movement. There are eight broad subject areas for evaluation of projects, and within this there are several sub-topics. Depending on the weight assigned to each area, the priorities for transit might be different. Some lines appear no matter what the weighting, while others come and go. Some proposals never make it into the “top ten” no matter which criteria are favoured. Note that in these maps, five projects that have already been approved at some level are assumed as part of the network and they do not participate in the evaluation: Eglinton, Spadina Extension, Scarborough RT Replacement, Finch and Sheppard LRT lines. This work gives a sense of where the City might be headed for priorities into the 2020s and the next round of Metrolinx funding should Queen’s Park ever arrive at the point of announcing a new round of projects. The evaluation did not include SmartTrack because it was not an active proposal until early in 2015 following Mayor Tory’s election and endorsement of studies by Council. Keesmaat stated that the relative evaluation may change now that both SmartTrack and GO/RER are better defined. Page 28 of the presentation shows a high-level view of the rankings of each project. Some projects score well consistently across all criteria, while others vary considerably. There was some confusion about the specifics of projects, notably “Finch West” which on this chart refers only to the proposed extension beyond Humber College to the airport. The first stage of this project is already approved and funded as an LRT line despite attempts by subway boosters to have a review of the technology. In that context, the airport extension necessarily would be LRT. The TTC Board members were quite impressed with this presentation, probably the most extensive, consolidated overview of the many projects now underway that they have ever seen. Far too much past discussion was mired in single projects rather than seeing how everything fits together. Whether this outlook will prevail as individual reports surface through the coming months remains to be seen. Toronto cannot have everyone’s pet project, no matter how much Mayor Tory might try to avoid saying “no” to anybody, and planning criteria and goals must not be gerrymandered to suit a politically desired outcome. In 2014, the TTC Board approved a shift from the current subway turnstiles to a new fare gate that will be sourced commonly by Metrolinx. The new gates will replaced both the “low” turnstiles at principal subway entrances and the “high gates” used at automatic entrances. The current report recommends purchase of $17.1 million worth of equipment with funding from various sources: the TYSSE project, the TTC’s Turnstile Replacement project, the TTC Presto project and Metrolinx (part of provincial funding for the new fare system implementation). When the TTC considered a report on Presto implementation in 2014, a mixture of new faregates and turnstiles with integrated Presto readers was proposed, and there was no mention of complete replacement of all of the TTC’s turnstiles. However, this approach changed sometime in the past year, and the TTC now proposes to replace all of its turnstiles at an additional cost of $38 million. This amount has not yet been approved by Council as a funded project in the Capital Budget. A related issue, which I have discussed in a separate article, is the apparent desire by TTC management to make provision for fare-by-distance charging on the subway. Exactly how this has become a priority in a very constrained Capital Budget is a mystery. TTC management proposes to order 108 new 40-foot (10m) buses from Nova Bus for delivery in 2016 and 2017. The purpose of these vehicles is to support ridership growth and an improved spare ratio for fleet maintenance. Retirement of the Orion VII low floor diesels (7400 to 7800 series buses) has been pushed back two years from 2018-21 to 2020-23. 240 of these vehicles will be overhauled in 2018-19. Retirement of the Orion VII low floor clean diesels (7900 to 8000 series) has been pushed back from 2023-24 to 2025 and beyond. These vehicles will be overhauled in 2020-21. Retirement of the Orion VII low floor hybrids (1000 to 1100 series) has been moved forward from 2021-23 to 2018-20. Retirement of the Orion VII low floor hybrids (1200 to 1700 series) is now planned to begin in 2023 probably until 2026. There retirement was not previously in the plan. Planned purchases are at a higher rate starting in 2019 and years beyond. Buses counted as “customer service initiatives” have now been rolled into the base service requirement in part for 2017-19 and completely for 2020 and beyond. This likely reflects the adoption of new service standards as part of the base. The situation with garage space will be quite difficult for the next five years. By 2018, just before McNicoll Garage comes on stream, the TTC will be short 450 bus spaces based on the current operations. This will be partly offset by a leased garage in York Region that will become operational in 2016, but the TTC will still require a large facility somewhere else and will continue to have severe crowding at existing locations. The need for a new large facility does not disappear until after the Eglinton Crosstown line opens in 2021 and other lines (Finch LRT and Scarborough Subway) a few years later, and even then ridership growth will push up the fleet numbers. A discussion of bus purchase and overhaul plans arose from this report and from a deputation by Alan Yuill suggesting that the TTC harmonize its bus requirements so that it could participate in the joint purchase of vehicles through Metrolinx (which already does this on behalf of many Ontario cities). The major difference for TTC buses is that they are specified to be sufficiently robust that they can survive for 18 years with mid-life overhauls. The typical transit bus in North America now has a much shorter life, typically 12 years, mainly because many transit agencies do not possess (or chose to retain) the capability of major overhauls. Moreover, the nature of the bus industry is that it has been heavily subsidized in the USA through federal grants that allow replacement of vehicles at a much younger age than had historically been the practice. Bus designs are no longer based on keeping the same vehicle in service for a much over a decade. TTC management, when asked, said that they would be happy with a 12-year bus, and this triggered questions of why the TTC actually specifies and buys 18-year buses. This matter has been before Toronto before, but during the Ford era when nobody was paying any attention to the details. In the 2014 Capital Budget, the TTC proposed reducing the planned lifespan of buses from 18 to 15 years. This was rejected by the City of Toronto because of the effect it would have on capital spending (old buses would come up for retirement sooner thereby accelerating spending in an already crowded 10-year plan). Because the City has a severe problem with affordability of the TTC’s capital requirements, all of the bus purchases, including those for added service, were moved “below the line” (unfunded). The purchase of 135 buses for service improvements is being placed below the line due to funding constraints. The purpose of these buses is purely for improving the existing loading standards but cannot be afforded at this time. Currently TTC operates buses for 18 years. The TTC submission was based on reducing the bus life cycle to 15 years, which would require TTC to purchase 400 buses plus an additional 900 buses for growth and replacement. A 15 year life cycle allows for a reduction to the Bus Overhaul project as an overhaul at 15 years would no longer be required. The 2014‐2023 Recommended Capital Plan includes reverting back to an 18 year life cycle, which requires an increase for bus overhaul and a reduction to bus purchases as a portion of the 400 and 900 buses would be transferred below the line, and the purchase of 165 buses based on an 18 year life cycle would be required. TTC staff intends to undertake a comprehensive life‐cycle analysis for buses in 2014 and to present a plan to the Board for consideration as part of the 2015 budget cycle. While reducing the expected life of a bus will result in additional capital costs, failure to implement an appropriate strategy for maintenance of the bus fleet will impact the integrity and reliability of the fleet and has the potential to significantly increase operating costs. What the City did was to push a great deal of the expense of renewal and expansion of the bus fleet beyond the five-year line in its 10-year plan [see chart on p.32]. This is an example of the ongoing financial hocus-pocus needed to retain some semblance of credibility in the Ford era plans. An important issue here is that bus purchases and major overhauls are financed by capital dollars which are, for the most part, 100% city tax money, while running maintenance on elderly less reliable buses comes from operating dollars which are funded mainly by the farebox (and indirectly by service cuts). The overhauls needed to support an 18-year life were restored in the 2014 budget. The City would love the TTC to flatten out its procurement requirements so that capital debt could be issued at roughly the same level each year. The problem with this premise for the bus fleet is that growth does not occur uniformly over the 18-year fleet cycle. Economic downturns, notably the early 1990s recession, allow old fleet to be retired without replacement, while periods of growth have a dual requirement to replace worn-out buses and beef up the fleet again for added demand. The TTC owns almost 500 Orion VII Clean Diesels (the 7400-7800 series of buses) acquired between 2000-05 as the system rebuilt from the 1990s. Current plans call for about 400 of these to be retired in 2021-22 when they will be at or beyond their 18-year lives. If a 15-year policy is adopted, this replacement cycle moves back three years into the very 5-year segment of the capital plan where the City has absolutely no headroom. The early 2020s coincide with the planned opening of major new rapid transit lines (Eglinton, Scarborough, Finch) and this triggers a drop in the TTC’s bus fleet requirements. It is actually advantageous to keep these buses in service a bit longer rather than replacing them with a complement of new buses that would create a surplus in the mid 2020s. The hybrid buses are already planned for replacement on a shorter cycle with the 150 first generation buses (1000-1100s) bought in 2006 due for retirement in 2018-2020. The next batches of 541 hybrids (1200s and onward) bought from 2007-09 will begin to retire in 2023. TTC management has agreed to bring back a comprehensive view of how fleet requirements will evolve for the surface routes, the implications of different lifetime regimes for the bus fleet, and the interaction of various rapid transit projects and policies (such as improved loading standards for off-peak and peak services, or implementation of an express bus network) with the fleet plans. Through the fall of 2015, the TTC will implement improved service standards for off-peak operation on routes which have scheduled “frequent service” of 10 minutes or less. The current standards call for seated loads, on average, on any route with headways greater than 10 minutes, but for frequent services, the standard is a seated load plus 25%. In the new standard, the seated load will be the value used on all surface routes. This change requires no additional vehicles because it is entirely during off-peak periods. The details of affected routes and time periods will come out later in the year with the schedule change announcements. The Toronto International Film Festival (TIFF) proposes to close King Street in the festival district for its opening weekend from Thursday, September 10 to Sunday, September 13, 2015. In past years, the TTC has attempted to operate through the district, or diverted around it. Operation through the district often encountered delays, and the diversion (via Spadina, Queen and Church) produced compound problems for both the King car and for Queen Street services which were held up by streetcars making turns at diversion points (without any assistance, I might add, from paid duty police or traffic signalling linked to electric switches). On the west, all 504 cars would operate between Dundas West Station and Bathurst Street, looping north to Wolseley Loop at Queen. On the east, all 504 cars would operate between Broadview Station and York Street, looping via Church, Wellington and York. There is a more general issue here for City Council. To what degree should festivals and other events be allowed to close city streets and disrupt transit service, especially on weekdays, in the name of “economic development” and making Toronto a more attractive tourist city? Updated July 25, 2015 at 2:45 pm: The following sets of charts illustrate the very large change in running times triggered in September 2014 by the TIFF diversion from King to Queen. These charts are taken from an article now in preparation on Queen car running times that will appear in a few days. The effect is quite striking on the two weekdays of the TIFF diversion, Thursday-Friday September 4-5, 2014. During the debate on this issue, it was clear that “the fix was in” from the Mayor’s Office for the TTC Board to support this arrangement. Cameron Bailey, TIFF’s Artistic Director appeared as a deputant at the meeting, and he spoke of the festival’s importance to the city and to the film industry. Pro-TIFF Councillor Shelley Carroll talked of how festivals take over major public spaces in other cities, although she neglected to mention the relative size of the cities or, in the case of the Berlin festival, the fact that the central location is served by underground transit, not a major streetcar line. In a bizarre piece of logic, it was argued that it is better to close King Street at TIFF right from the start of service on Thursday September 10 rather than waiting until midday. The latter scheme (used in 2014), might “confuse” riders who come to work on regular routes only to find that they cannot return home in the evening. Instead, TIFF will screw up King for the entire day. Equally bizarre is the idea that having a blizzard of “information” to affected riders will somehow make things OK. TIFF will pay for this campaign, but not for the actual service disruption. For the TTC’s part, the west end King service will terminate at Queen and Bathurst. Riders from Parkdale and Liberty Village, who have enough to complain of as it is with service on King, will be dumped off of the 504 at Bathurst and left to walk into downtown, or hope to find space on the 501 Queen car for which no supplementary service is planned. Another problem will arise for the substantial number of riders who originate downtown in the AM peak and travel outward to jobs in Liberty Village. They will have no through service to do so. As a long-time donor to TIFF, I am embarrassed that “my” film festival is causing such needless upset to workday trips by thousands of riders. TIFF is now accustomed to taking over King Street and disrupting transit service there, including for people who might want to see a film. The redesign of John Street, a project that is now approved, includes provision for major events and street closures on John adjacent to TIFF. As an alternative to closing King, at least to transit vehicles, this must be pursued as an alternative scheme for 2016 and beyond. Beyond the information in the CEO’s Report, there will be a briefing on this project in the confidential session of the meeting. If any details emerge, I will add them here. “That staff be requested to report back at the next Board meeting on a range of options, including the exclusion of Bombardier from bidding on future contracts for new vehicle purchases for a specified period of time, based on poor performance related to the delivery of the new streetcars”. Although “DMW” as he is known in shorthand among City Hall regulars can often be counted on to throw spanners in the works as much for self-promotion as for his role as a public watchdog, the purpose of this question was to put Bombardier on notice that the TTC is displeased with the streetcar project. The staff report lays out the process by which any vendor would be excluded from further work, and it is a multi-step process triggered both by specific failures to meet contract specs, and formal steps, including appeal, to resolve the situation between vendor and client. This is a serious business which is not entered into lightly. An obvious question for the TTC (and by extension for Metrolinx) would be just what such a move would do to the long-standing relationship with Thunder Bay as a source of rail vehicles generally in Ontario, and for Bombardier’s reputation and ability to gain other work in the wake of a Toronto black-listing. This is more bark than bite, although it will no doubt provide an opportunity for political grandstanding. The real issue is for Bombardier to sort out its manufacturing capabilities, and its larger corporate problems with the money pit of its aircraft business. Updated August 2, 2015 at 10:00 pm: This item was referred to the September 2015 Board meeting. b. “Closing the Gap” on a dedicated right-of-way from St. Joseph Hospital to Exhibition Place and connection options. Park Lawn Loop has been on the books for many years, but remains unbuilt due to limitations in the TTC’s Capital funding stream. It replaced an earlier scheme to build a branch north from Lake Shore via Legion Road to a proposed new Mimico GO Station. The purpose of this would be to bring the relatively more frequent service available at Humber Loop west into at least part of the new condo district along Lake Shore. The need for this loop may be partly offset by plans to eliminate the scheduled Humber short turn on 501 Queen this fall, and to improve service both with extra running time and more capacity (per the new Service Standards) in off-peak periods. “Closing the Gap” has been discussed in various ways going back to 1990 and the original proposal for a Waterfront West LRT line. At one time, the scheme was to route cars from Lake Shore east along King, south on Dufferin, and then east along the north edge of Exhibition Place to connect in with the existing loop used by 511 Bathurst and 509 Harbourfront cars. During the Transit City era, there was an alternative plan developed that would take the route south via Colbourne Lodge Road from The Queensway, and then east on a revised Lake Shore Boulevard through the Sunnyside area to connect up with the original plan roughly at Dufferin Street and thence to Exhibition Loop. This would avoid taking the “Long Branch” service through the extremely congested King West area, and especially the intersection at Roncesvalles which is already a major source of delay. The alternative plan, of course, is more expensive because it requires more net new streetcar mileage and some reconfiguration of existing roads. Unfortunately, this plan including better access to the western beaches at Sunnyside, fell out of sight and memory with the demolition of Transit City. Any review of a Lake Shore connection to downtown through the CNE should include this alternative. Further east, there is the matter of the “Bremner streetcar” proposed by the TTC. This would branch off from the existing Bay Street tunnel, run west through the basement of the Air Canada Centre, and emerge onto Bremner west of Lower Simcoe. The TTC has yet to explain how such a line would deal with the traffic situations regularly encountered there from the Rogers Centre, or what the street layout would look like including a right-of-way and transit stops. Council’s request is before the Commission “for direction”, that is to say, should staff spend time on these requests? One can only hope that if they do so, the reports are more than superficial reviews. Updated August 2, 2015: This item was referred to the TTC’s Budget Committee for consideration with the 2016 Capital Budget. This entry was posted in Buses, Fares & Fare Collection, Finance, Queen Car, Service Cost and Quality, Streetcars, Subways, Transit, Waterfront. Bookmark the permalink. While I appreciate the need for parking these buses, I am somewhat disturbed that this would preempt an option for transit. However, essentially given street width – would it not be virtually impossible to create a dedicated ROW without creating a situation where a single vehicle stopping stopped all traffic? Steve: That is precisely my point. Bremner was not designed to have a right-of-way added to it, at least not on the eastern section. Without that, the grassed median west from Spadina is useless. How stupidly expensive would a tunnel through this section be – Air Canada Centre to Spadina? Would require what in the range of 750 meters – 1.1 KM to make it work? Steve: Extremely. Aside from the fact that you are near the lake and all of the “land” used to be underwater, there is a small problem with an underground structure that cross Bremner linking the convention centre to the parking lot. The line would almost certainly have to rise to the surface west of Spadina into the existing median, and so the interchange with the Spadina car would be grade separated (not a bad thing actually, and one of the original schemes for a Spadina/Bremner station). There is still a problem with the intersection at Bathurst and the route west to Exhibition Place. Again, it’s an area that was not designed for an LRT line because the WWLRT was supposed to be on Fleet Street — that’s why the right-of-way from Bathurst to Strachan was built. Construction would have to be cut-and-cover (short tunnel, close to the surface, no place for a staging area for a TBM) with severe implications for traffic and access in this area easily for a year. Which would mean that – we would in essence need to revisit Union Station Loop designs, if we were ever to be serious about WWLRT coming all the way to the core, and hope that the set up there and on Queen’s Quay could actually come close to supporting the sort of combined frequency required (Spadina, Harbourfront, East BayFront, and Lakeshore all) using a loop at Union, and that tunnel – (seems really busy). Alternately – the DRL would need to run far enough west to support this line and a Western GO station. Too bad this was not considered in the initial planning of the area – especially given how relatively recent it was – what a difference and extra 8 or so meters could have made! Open question to all: Will the Flexity cars on property be moved from Roncesvalles to Leslie once the latter facility opens? An update from the Toronto Star suggests the Bombardier delivery schedule for the LFLRV’s has slipped yet again. Shoddy workmanship originating from their Mexican plant is being blamed yet again. Leslie might well be sitting empty for a while yet if the 10 cars (really 11) on property stay at Roncy. Steve: The TTC issued a statement on this which is the basis for the news reports.